The objective of the floor plans is to design furniture layout, wiring systems, and much more. They're also very suitable for real estate agents and leasing companies in allowing sell or rent out a space. 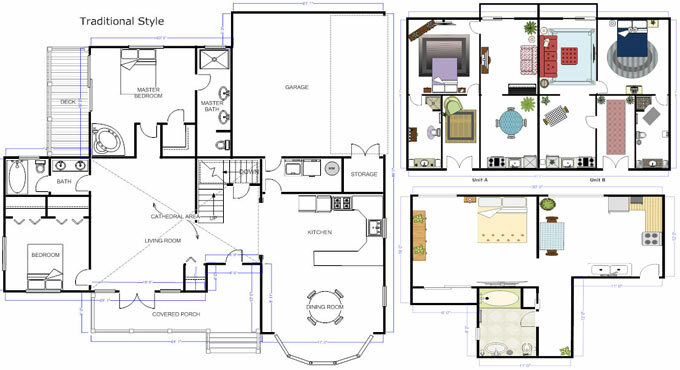 Floor plans play an important role while designing and building a home. A good floor plan can make a pleasant flow among spaces and can even enhance its resale value. • Adaptable and flexible. Ensure that in near future an office can be transformed into a child's bedroom smoothly whether for your family or a future buyer's. • Ideal room layout. Ensure bedrooms are distant from entertaining spaces. The face of the bathrooms shouldn't be directed to entertainment spaces like dining rooms or living rooms. Most people will prefer that the kitchen should be opened to the dining or living rooms in order that whoever is cooking can still keep in touch with guests or monitor on the kids playing. • Size matters. While making design of any room or hallway, consider how many people will stay in that space all at once. Is there room for them to move around? Is there room for furniture to coordinate all the planned activities? • Fits your priorities and lifestyle. If entertaining is crucial, ensure there's a good flow from the kitchen to an exterior space and living room. While going to work from home, ensure there is adequate light and home is situated in a quiet location. While performing laundry work, is it perfect to climb three floors to shift from your master bedroom to the laundry room? • Get the balance among architectural details and practical considerations. Concentrate on the security of kids, cleaning, heating and cooling bill prior to select some majestic staircase or floor to ceiling windows. • Select an area. Find out the area that will be drawn. If the building is already there, choose how much (a room, a floor, or the complete building) should be drawn. If the building does not yet subsist, plot out the designs on the basis of the size and shape of the location where the building should be constructed. • Get measurements. If the building subsists, work out the walls, doors, and relevant furniture to make the floor plan perfect. If the layout is to be developed for a completely new area, ensure that the total area will accommodate where it should be constructed. It is suggested to study buildings which are constructed in identical areas to be employed as an estimate for this floor plan. • Draw walls. Insert walls for each room of the building, keep in mind that the walls should be drawn to scale. • Add architectural features. Start adding features to the space by providing the inflexible things, like the doors and windows, along with the refrigerator, dishwasher, dryer, and other vital instruments that should be arranged in a particular location. • Add furniture. Include furniture if it is required for the floor plan.